On Wednesday, Airbus delivered the first aircraft in its upgraded family of A320neo narrow body jetliners to Lufthansa. News that a European aircraft maker is delivering planes to a German carrier might not sound like a breakthrough for American technology, but in this case it is. That’s because the “neo” designation of the Airbus family stands for “new engine option,” and the planes Lufthansa has bought will be equipped with a revolutionary “geared turbofan” engine made by United Technologies unit Pratt & Whitney. Pratt has spent $10 billion and 20 years developing the geared turbofan, which it is marketing in multiple variants as the PurePower family of high-bypass engines. To say the PW1100G engines built specially for the A320neo are a breakthrough is a bit of an understatement. The engines will reduce fuel consumption 15%, extending the plane’s range by 500 nautical miles. They will reduce environmental emissions by 50%. They will reduce noise by 75%. And that’s just for starters – the fuel savings will grow to 20% by 2020 as the engine technology is refined, and Airbus is projecting major savings on aircraft maintenance. The key to the gains is a reduction gearbox built into the engine that allows each of its sections to spin at optimum speed. It’s an idea that has been around for some time, but was devilishly difficult to develop into the kind of engines a next-generation narrow body required. The clearest indication Pratt & Whitney has succeeded is that 7,000 of the engines have been ordered before the first commercial flight even occurred. Most of the aircraft makers adopting Pratt’s PurePower line plan to make it the sole propulsion offering on their new jets. Airbus will offer two options on the neo — including an upgraded conventional turbofan from GE — but there isn’t any doubt which engine will be quieter, more fuel efficient, or more environmentally friendly. It will be Pratt’s geared turbofan, which has already disrupted business as usual in the short-to-medium haul segment of the market to such a degree that every aircraft and engine maker has been forced to respond with new product offerings. Unfortunately for Pratt’s competitors, there is no way they can catch up with the Connecticut-based company’s lead in new technology anytime soon — which is one reason why Pratt expects engine production to double through the end of the decade. The other reason is the F135 engines it is building for Lockheed Martin’s F-35 fighter, a program that will deliver over 3,000 stealthy tactical aircraft to three U.S. military services and a dozen overseas allies. That program is ramping up too as the price of engines and airframes falls in each successive production lot, headed toward a price-tag per plane similar to that of the Cold War fighters the F-35 will replace. Pratt is the exclusive supplier of engines for the F-35, which means both the military and commercial parts of its business are looking bullish for decades to come (much of its profits come from the aftermarket, supporting fielded engines during multi-decade service lives). But it is the geared turbofan that I want to focus on here, because the PurePower family is emblematic of what U.S. manufacturers can accomplish in global commercial markets when they have a vision of the future, coupled with the discipline and skills required to make that vision real. Pratt generates 90% of the PurePower family’s content by value within U.S. borders, even though 80% of the engines are sold overseas (the engines already have 70 customers in 30 countries). It is an amazing feat to have accomplished this with a manufacturing base concentrated in the high-wage, high-tax, heavily-regulated state of Connecticut. I go into it in greater detail in a report I released today. United Technologies has been a contributor to my think tank for some time; I have been able to closely follow Pratt & Whitney’s efforts to best its competitors for the better part of a decade. When I first encountered the unit, it was struggling to keep up with competitors in both the military and commercial segments of the engine market. Now it looks to be pulling ahead, and what my report illuminates is the steps Pratt had to take beyond developing revolutionary technology to achieve the success it is experiencing today. Pratt & Whitney belongs to a small fraternity of American manufacturers such as Boeing and General Motors that have managed to remain on top since the early decades of the 20th Century (the “American Century”) by continuously adapting to changing markets and technology. The company finished developing its first aircraft engine on Christmas Eve in 1925 and still uses the East Hartford assembly facility it constructed four years later. But what goes on inside that plant and the rest of Pratt has changed continuously. In fact, successfully bringing the geared turbofan to market might not have even been possible without the latest transformation of Pratt’s internal culture. That transformation was driven by management’s recognition that a Connecticut-based manufacturing enterprise would have difficulty competing in a globalized, digitized economy if it did not thoroughly rethink every facet of its business. Unlike many other U.S. companies that chose to move manufacturing offshore to low-wage locations, Pratt elected to stick with its roots in America. For starters, it needed the intellectual-property protection that the U.S. legal system afforded. Also, it relied on a complex aerospace infrastructure that would be difficult to replicate elsewhere. In addition, it deeply valued the quality and dependability of key suppliers with whom it had enjoyed relationships for decades. The challenge was figuring out how to remain price-competitive as an American manufacturer while meeting ever-rising customer expectations for cutting-edge technology, superior quality, and timely delivery. The answer, as it turned out, lay in two emerging management concepts: core competencies and lean manufacturing. The core competencies concept argues that most enterprises can only be world-class at a handful of activities, and so that is where they should concentrate their efforts. Other activities necessary to the business should be outsourced to suppliers who are themselves world-class at what they do. The notion of lean manufacturing evolved from processes developed in the Japanese auto industry aimed at minimizing waste into a management philosophy of continuous improvement. It stresses perfect first-time quality, smooth production flows, just-in-time deliveries and worker empowerment. By applying digital technologies and advanced workforce training to those goals, Pratt was able to accomplish major gains in efficiency. The company became highly proficient at measuring performance metrics such as inventory turns and worker productivity, with an eye on eliminating any impediments to maximizing quality and minimizing cost. The enterprise that emerged from management’s efforts to transform the work culture has off-loaded activities better performed by outsiders while retaining the front-end of the product life cycle where engines are designed and developed, plus the back end where they are integrated and supported. In other words, Pratt & Whitney retains the functions where it is unsurpassed, while relying on a rigorously managed supply chain for inputs where others are more efficient. Thus, whereas the company internally generated about half the parts it needed during the last big ramp-up of engine production, today that share is down to around 20%. Many machining jobs within the company have been lost as new processes changed the way work was done. But a lot of these jobs didn’t disappear, they simply moved into the supply chain where production could be accomplished more efficiently with no loss of quality. The top tier of Pratt & Whitney suppliers recognized under its “supplier gold” program achieve perfect first-time quality 99.99% of the time. Pratt has 450 suppliers deemed critical to its business, the vast majority of which are located in the U.S. 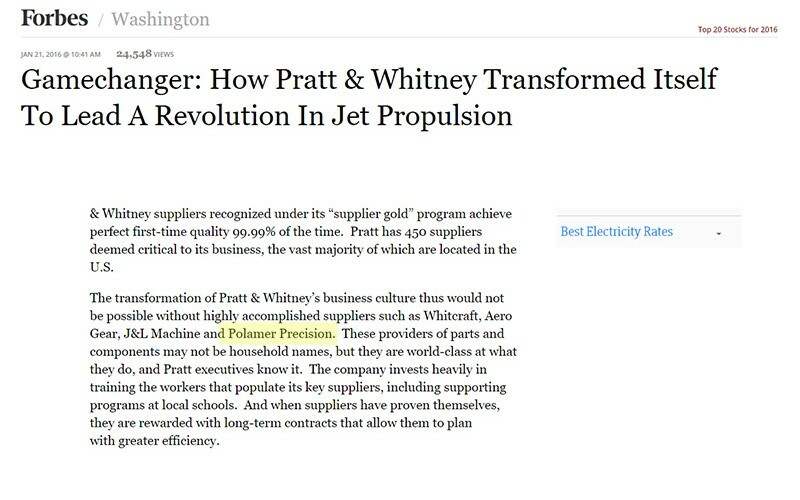 The transformation of Pratt & Whitney’s business culture thus would not be possible without highly accomplished suppliers such as Whitcraft, Aero Gear, J&L Machine and Polamer Precision. These providers of parts and components may not be household names, but they are world-class at what they do, and Pratt executives know it. The company invests heavily in training the workers that populate its key suppliers, including supporting programs at local schools. And when suppliers have proven themselves, they are rewarded with long-term contracts that allow them to plan with greater efficiency.